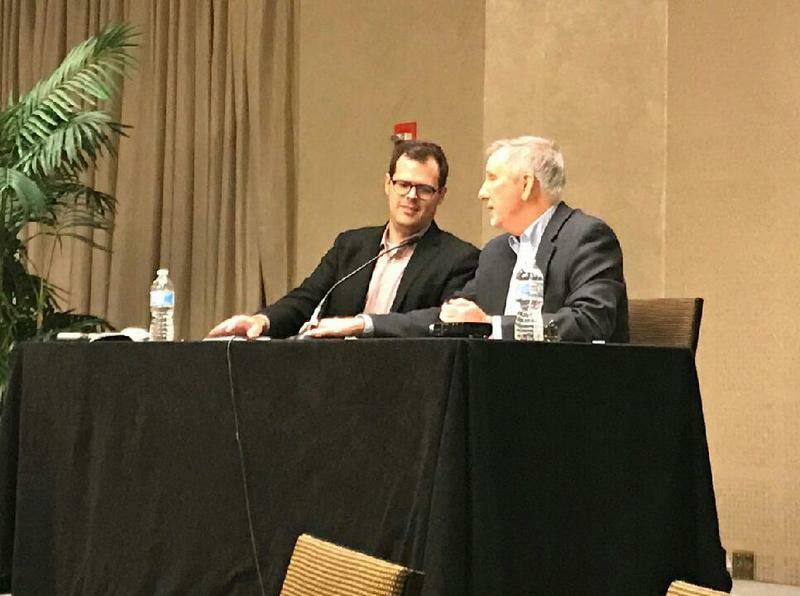 NPR's congressional correspondent Scott Detrow (left) shared strategies for covering the midterms with WHYY's Dave Davies (right) on Friday afternoon. Davies: Folks in this room have covered a lot of races. You know that what's really interesting is when you get into the local issues and the local personalities. Every race has its own set of characters. The more you learn about it, the harder it might be to explain to a national audience who's probably never heard of a lot of these folks. How do you wrestle with that in your coverage? It's really tough, and I'm always mindful of that because I was a member station reporter for so long. When you're covering a race for your station, when you're covering it for the local audience, you get into so many different issues. There might be this really micro-targeted issue that's really key there. But when I'm doing a story for NPR, that's not the way I'm looking at it. I'm looking at: What are the big picture trend lines we're trying to keep track of this year? How does this race of set of races fit into that national trend line. But I think there are some trend lines that—no matter how you're coming at it—you need to get to. What is the point of the story you're trying to get to? What is the scene that you want the listener to stick with in their mind? If you can, base the majority of a congressional story in one setting, in one scene, whether that's a lively debate between the candidates.... or a something else. If you can keep it to one scene, I think that helps bring the listener through a lot of complicated issues that you're trying to sort out, especially if you have a 3- or 4-candidate field. Audience question: How do you create nuance in your coverage of opposing political views during the midterms, instead of just outlining process/proxy arguments? First of all, you need to do as many stories as possible. Even if you stick to one issue, like the tax overhaul that just recently passed, for example, you could do a five part series on what specifically was in the bill, how a person in your area voted on it, and what his/her challenges were, etc... I think the biggest challenge is to simplify it one story at a time. Because if I start talking about tax rates [by bracket]....it doesn't work on the radio. It loses people very quickly… That's why I think it's so important to talk to real human beings. Base these stories on voters, on candidates interacting with voters, and get whoever is in the story to talk about the issue. Audience question: Do you have any tips for catching politicians unscripted? Just asking around, creeping around on their Facebook page. If your phone can stand it, turning on all of their social media alerts--the push alerts. So that way you're getting a text every time his/her campaign tweets. Because they might say, "Hey, knocking on doors in Center City. Come out and meet us!" So if you can get in your car and go and just happen to be there with your microphone, I think that works out as well. And just trying to get to know as many people on the campaign as you can. Thursday’s multimedia storytelling event proved that it can. 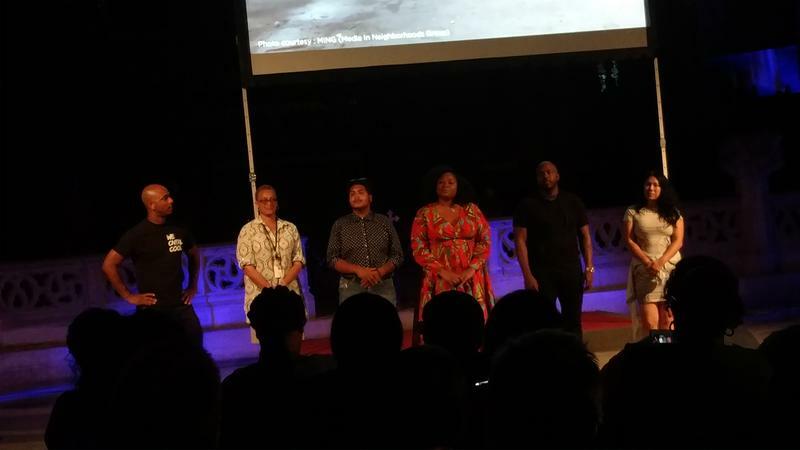 Put on by WHYY, The Association of Independents in Radio (AIR), the Lenfest Institute, and the Wyncote Foundation, “Finding Sanctuary” featured stories of seeking peace, celebrating culture and joining together to build community.